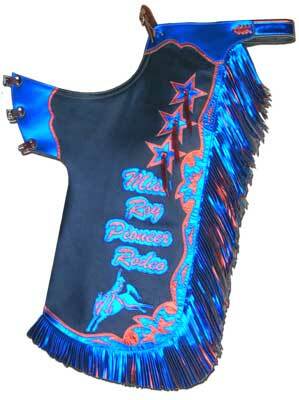 Custom made Rodeo Chaps, Rodeo Gear, Chaps, Bull Riding Chaps, Western World Saddlery, Caboolture, Brisbane. 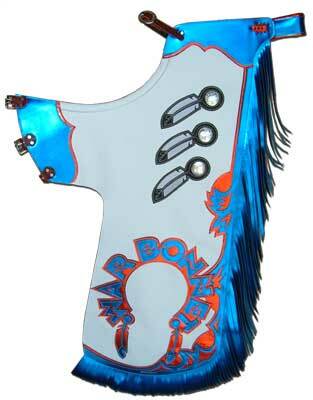 Our rodeo chaps can be made in a one-color, two-color, or three-color. See the pictures below. 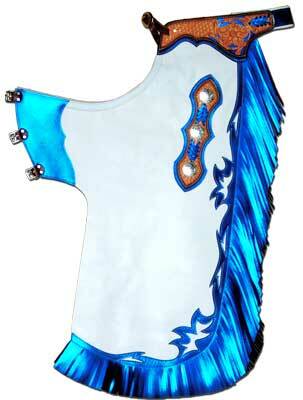 Note: the 3-color chaps pictured below show additional tooled top yoke, tooling side yoke, and conchos options. and fringe colors at no additional cost. The main body can also be made from rodeo colours with additional cost. chap accessories that you desire. your rodeo chaps with additional charges. 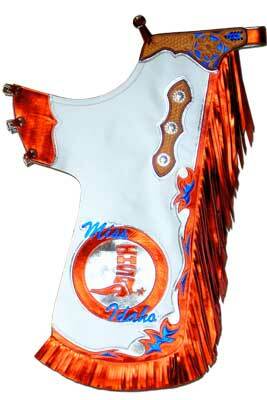 Custom Deluxe Rodeo Chaps, basic leather. 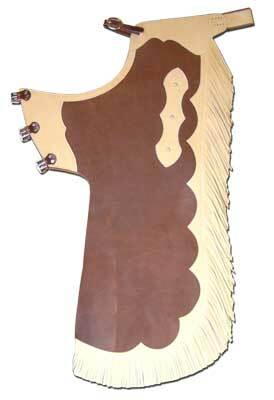 This chap features our scallop fringe pattern with buckskin colored fringe. l closely match your description of color. 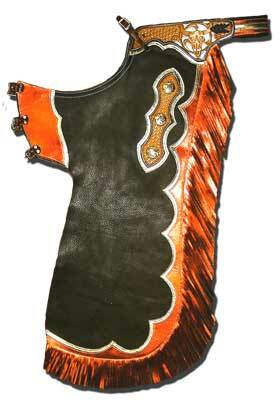 If we don't have the color you want, you may need to special order your rodeo chaps with additional charges. your color request. If necessary, we can email a digital photo of the leather that will closely match your description of color. 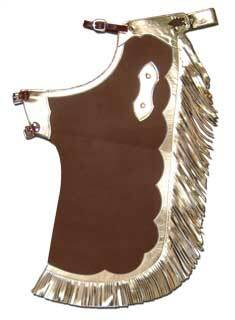 Added accessories: Buffalo filigree top yokes, Basket side yokes, Montana silver moon conchos. 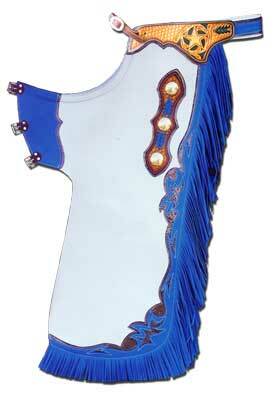 border-royal blue metallic, Vbraid on side yoke-royal blue metallic, Montana silver moon conchos-6pc. side yokes-royal blue, Montana gold moon conchos. 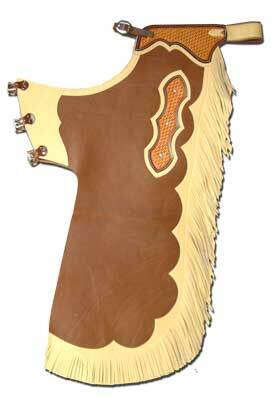 Custom Deluxe Rodeo Chap, deluxe leather, white color. This is a 3-color rodeo chap featuring our swirl fringe pattern. the chaps, we will charge for setting up the logo. with royal blue metallic fringe and red metallic trim. It also features double fringe with red metallic fringe. provided to us will require an additional charge for set-up. Miss "NHSRA" Idaho custom logo on both legs. If the custom logo is not provided, a set-up charge will be applicable. 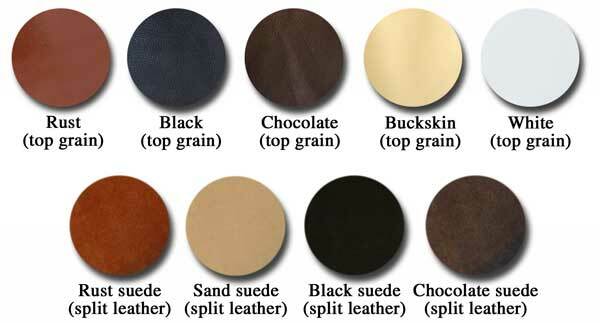 These colors my be used for trim and fringe on rodeo chaps at no additional cost, any stock color may also be used. If you don't like the colors or weights of leather that we keep in stock, we have a huge selection of leather available that we can special order for your chaps. time for your custom chaps will not be affected.